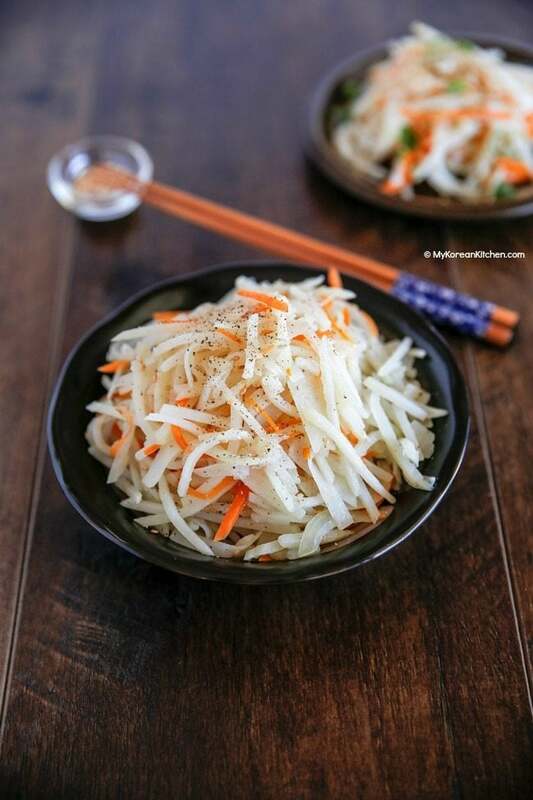 Korean stir fried potato side dish is one of the easiest Korean side dishes you can make! It’s crunchy and mildly flavoured popular Korean banchan! Korean stir fried potato side dish recipe is something that I meant to share for a while. FYI, it’s been sitting in my draft folder for 3 years! I don’t know what kept me from sharing this simple recipe sooner but I knew it was time to finally do so! 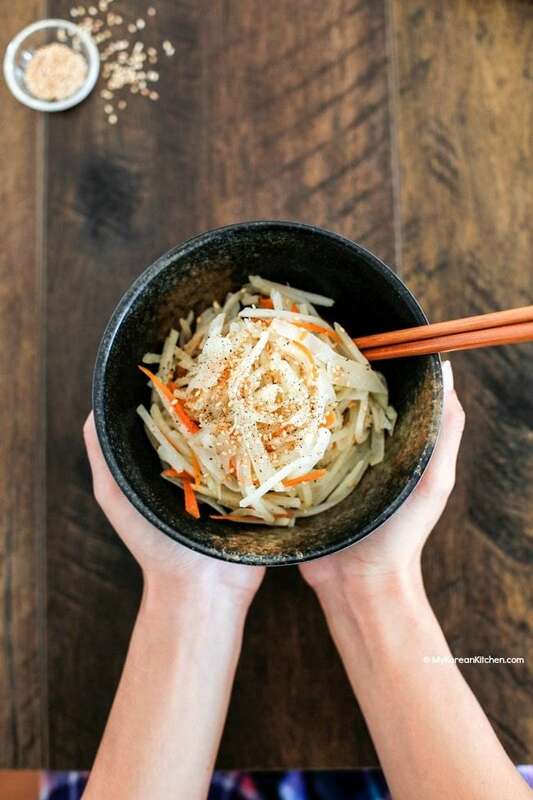 There are a few different ways you can make Korean potato side dishes. 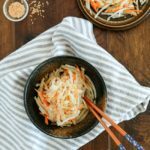 My absolute favourite versions are rich and creamy Korean potato salad and sweet, salty and addictive Soy sauce braised potato. 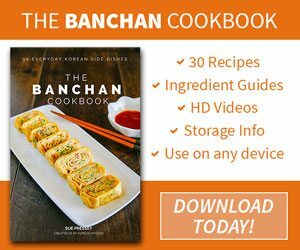 You can check them out from my Banchan Cookbook. 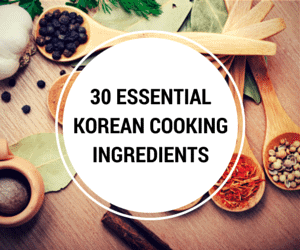 It’s a cookbook dedicated for Korean side dish lovers! Today’s version is called Gamjachae Bokkeum (감자채 볶음) in Korean. 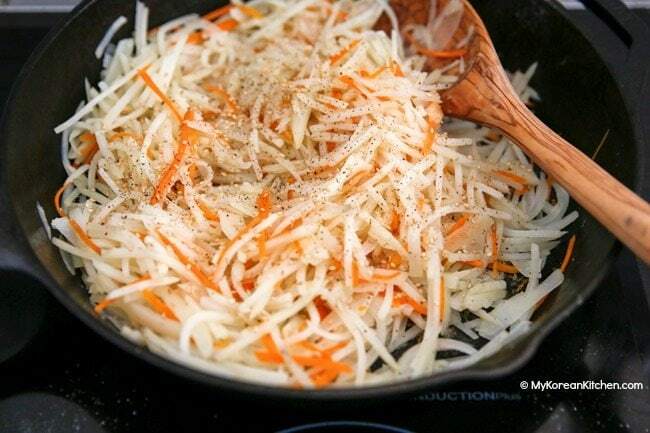 The direct translation of the dish is stir fried shredded potato or julienned potato. Because of the way the potato is shaped, some people describe this as Korean style pan-fried french fries. But it’s not really crispy like those types of potato chips. Nonetheless, it is a healthier choice! One thing I love about Korean stir fried potato side dish is that it’s very easy to make and it only requires a few basic ingredients (oil, salt, pepper and potato). Though most people add a few slices of carrots or bell peppers/capsicums to give extra poppy colours. Anyway, I hope you like this easy Korean potato side dish! 3 medium potatoes (600g/1.3 pounds), julienned – I used my mandoline slicer. (Optional) 1/3 small carrots (20g/0.7 ounces), julienned – you can use other colourful vegetables such as bell peppers/capsicum alternatively. 1. Soak the julienned potato in cold water for about 15 mins to remove excess starch. Drain the water and pat dry the potatoes with kitchen paper or clean cheese cloth. 2. Preheat a large skillet/frying pan over medium heat and add some cooking oil. Add the potato and stir gently and often until it starts to soften. Add the onion and carrots and sprinkle with the salt (I used my fingers to spread it evenly around the potatoes) and stir often until all are cooked. (You can also cover with the lid to speed up the cooking process. 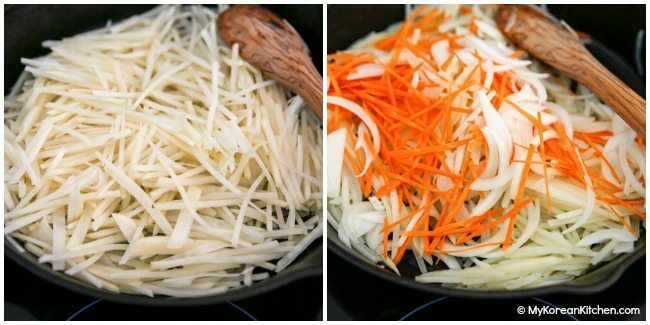 Just make sure you stir them often as potatoes very easily to stick to the pan.) Ideally, the potatoes should retain a firm shape and slightly crunchy texture. You can cook longer if you prefer a softer texture. 3. Season with black pepper (& more salt to taste if required but I didn’t use it). Garnish with some roasted sesame seeds. 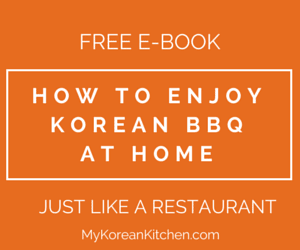 Serve with steamed rice and other Korean side dishes. It can be served hot, cold or at room temperature. Any leftover can be refrigerated in an airtight container for a few days. 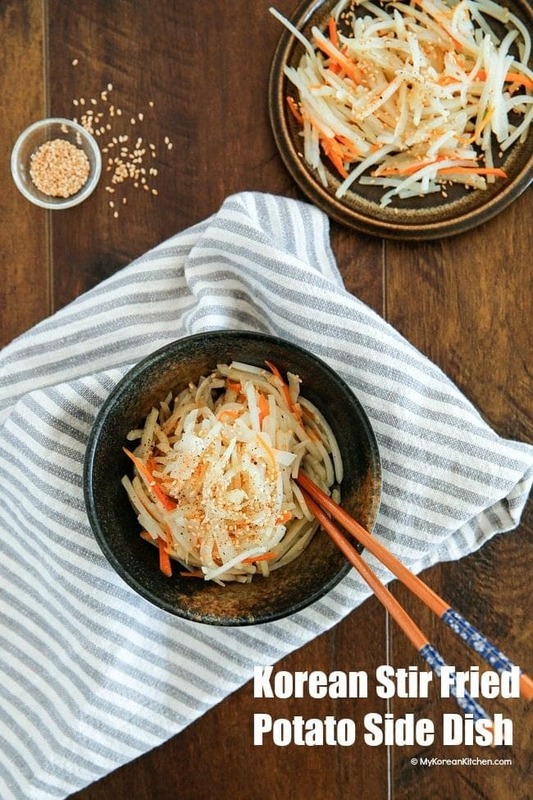 Korean stir fried potato side dish is one of the easiest Korean side dishes you can make! It's crunchy and mildly flavoured popular Korean banchan! 1/3 small carrots (20 g / 0.7 ounces), julienned, you can use other colourful vegetables such as bell peppers/capsicum alternatively. 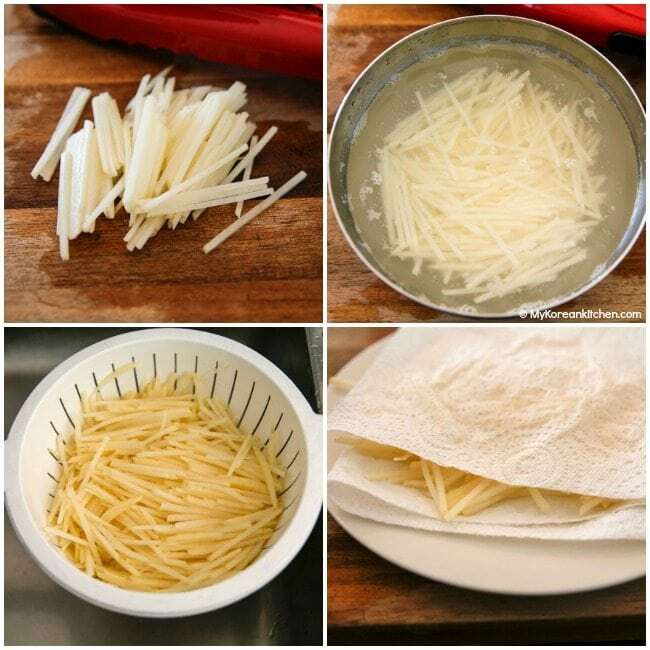 Soak the julienned potato in cold water for about 15 mins to remove excess starch. Drain the water and pat dry the potatoes with kitchen paper or clean cheese cloth. Preheat a large skillet/frying pan over medium heat and add some cooking oil. Add the potato and stir gently and often until it starts to soften. Add the onion and carrots and sprinkle with the salt (I used my fingers to spread it evenly around the potatoes) and stir often until all are cooked. (You can also cover with the lid to speed up the cooking process. Just make sure you stir them often as potatoes very easily stick to the pan.) Ideally, the potatoes should retain a firm shape and slightly crunchy texture. You can cook longer if you prefer a softer texture. Season with black pepper (& more salt to taste if required but I didn’t use it). Garnish with some roasted sesame seeds. Serve with steamed rice and other Korean side dishes. Thanks for this! Made this for my family tonight and they finished it up so quickly. It’s a wonderful side dish to accompany a dish that’s very rich in flavor. Great to hear that, Lynn! Thanks for your feedback! good job! Can’t wait to start trying your recipes!